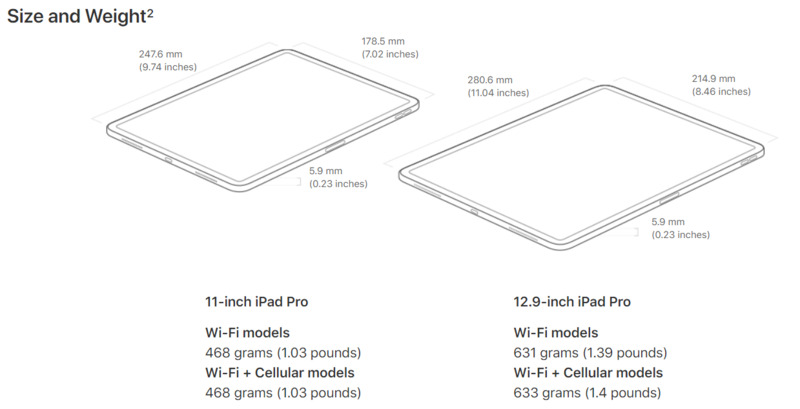 The newest iPad Pro is a tablet with a much thinner chassis than its predecessor. However, this is because it no longer has a headphone jack. The iPad Pro 2018 also has USB type C, for improved transfer speeds and maybe more. Hopefully, this will be worth living that dongle life. Apple unveiled the iPad Pro for 2018 during its second October event in Brooklyn. This update has, in line with some predictions, dropped the Lightning port in favor of USB-C connectivity. Both models of the new tablet have a 3.1 USB-C (1.0) port, which are capable of MagSafe-like attachment. Apple has asserted that this has been done in order to enhance transfer speeds between the tablet and other hardware such as laptops or DSLRs through cables. However, the port cannot be used to read external drives, not even USB sticks, as many newer Android phones can. This may have been done to drive the higher-memory SKU sales for this new product: the iPad Pro 2018 starts at 64GB fixed storage, and goes up to 1TB this year. The USB-C port can also possibly be used to charge a phone off the iPad Pro's battery (the capacities of which are not available at this time). This advantage, along with the sudden freedom from proprietary Lightning adapters and cables, has resulted in some positive reception from iPad users. Both SKUs (11- and 12.9-inch screen) of the tablet are only 5.9mm in height thanks to their new port. The two models also come in WiFi-only and WiFi+LTE variants, and will start at US$799 for the smaller model and $999 for the larger.